Microfocus product upgrades can take some time, depending on the amount and size of important data or projects, as well as your own customization. An upgrade can take a customer as little as a few weeks, to a few months depending on these variables. A well thought out upgrade plan is key. This should include environmental details, as well as a good user adoption plan, for all of the new features and functionality that come with this upgrade. It is also important to make sure your Site and Project admins also receive specialized training to understand what takes place throughout the upgrade process and new administrative features that will benefit the new environment & users. Northway’s Upgrade offering delivers expertise that supports and accelerates deployments for any size customer. Starting from the ground up, the deployments are designed with best practices in mind and are ready to scale as needed. 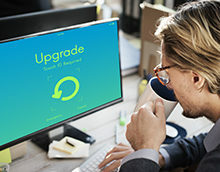 These upgrade services are designed to help customers migrate quickly and safely to the most current version of Quality Center, ALM, Performance Center or PPM, while minimizing business risk. This engagement is delivered by a Certified Product consultant and is comprised of a strategic upgrade process described below. Upgrade Planning: NWS PS will work with you to determine the optimal approach for your Upgrade. New feature matrix: Map the latest features to potential business requirements leveraging newly introduced Microfocus product capabilities. Perform and validate upgrade: Implement approved upgrade plans on Microfocus product and validate its success. Audit customization, reporting and dashboards: Create an inventory of previous customizations, dashboards & reports and test functionality on the upgraded release. Deployment documentation: Deliver a comprehensive deployment document to detail the specifications, deployment methods and other architectural considerations in your production environment. Get on the latest version, faster: Leveraging subject matter experts of Northway’s certified product specialist team and upgrade to the latest release more quickly. Northway Resources Onsite or Remote: Work with a dedicated Northway Professional Services expert onsite or remotely throughout the upgrade process. Document your product installation: Use Northway experts to fully document your newly upgraded Microfocus product infrastructure. New Feature Matrix: Map new features to business requirements for future software implementations. We are here to help customers get the most out of their Microfocus product deployments. Our services are backed by Microfocus Certified experts, who provide consistent and quality service delivery, architecture guidance, training and ongoing support. Take your Microfocus environment to the next level and achieve continual optimization, enhanced processes and active collaboration. Contact us for additional information or to discuss your upgrade options today.